September 26, 2018 By Erika C.
What happens when you invite a well-respected science museum to visit a unique group of pioneering students? Aside from an incredible meeting of the minds, you get a great story of insight from the science leaders of today for the future scientists of tomorrow. 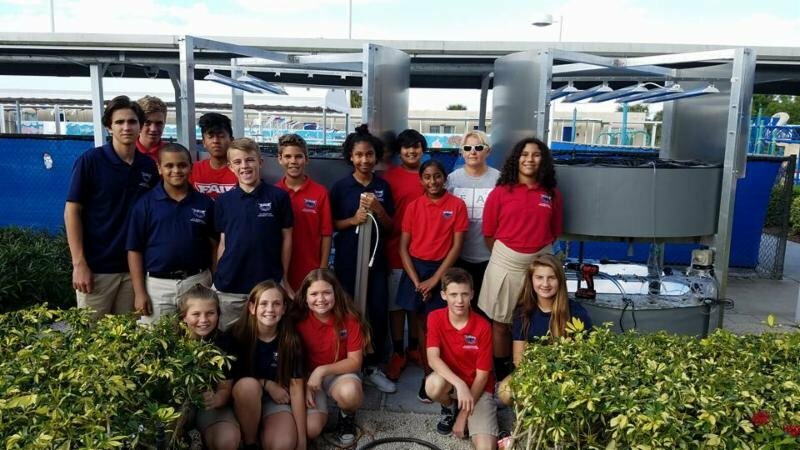 Earlier this month, executives from Fort Lauderdale’s Museum of Discovery and Science (MODS) visited A.D. Henderson University School, a public laboratory school that serves elementary-middle school (K-8) students on the campus of Florida Atlantic University in Boca Raton, Florida. To say the least, the school is highly competitive, nurturing advanced learners especially in the realm of math and science. The high school is merit-based, with students taking college readiness exams as early as 8th grade to be accepted. The school is also a leader in innovation and discovery and operates two AquaGrove systems that are completely managed by their students. The Museum of Discovery and Science has its own accolades and impressive resume. It is a top spot for visitors of South Florida and hosts more than 450,000 visitors each year! It has received an extensive list of awards and recognitions including “Favorite Museum” by Broward Family Life (2016), “Best Museum and Movie Theater” by SouthFlorida.com and the 2017 TripAdvisor® Certificate of Excellence (6th consecutive year). Since opening in 1992, the Museum has had more than 10 million visitors and currently serves 90,000 students on an annual basis through school sponsored field trips. Having approximately 120,000 square feet of dynamic science exhibits, it offers cutting-edge programming that is intriguing and educational to visitors of all ages and interests. “We, as well as several representatives from One Hope School, enjoyed an extensive tour of the facility. Allan Phipps showed us the AquaGrove units and explained how students help to monitor their performance. We were able to see the little ‘condos’ that they created for the crawfish. Plant and marine life were flourishing, so they are doing a terrific job of maintaining the appropriate balance. We talked extensively about how the units operate, how they have adapted them (hence the condos), and other factors that arise for the two units being outside such as rain. For every question we asked, Allan and his team had answers for us. Representatives continued with discussing opportunities for AquaGrove and the Museum of Discovery and Science. For future generations to have a healthy planet, it requires educating the students of today on sustainable practices (including aquaponics) that will ensure a brighter tomorrow. AquaGrove looks forward to working with MODS and being a part of their good work and efforts to deliver meaningful learning opportunities to supplement science education and provide enriching programs for the community and visitors from all over the world.